Venezuela is suffering from the ravages of hyperinflation—a rather rare phenomenon. 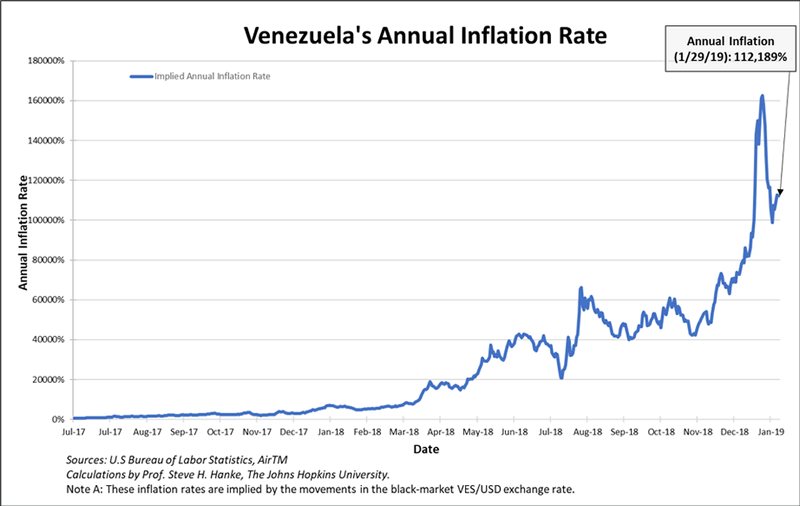 Indeed, there have only been 58 episodes of hyperinflation recorded in history, but Venezuela’s episode is a special case. Although its rate of inflation is modest by hyperinflations standards, its longevity is extended. Venezuela’s episode has lasted a 27 months to date, and there have only been 4 other episodes recorded in history that have lasted longer. For some time now, the United States has been using Venezuela’s vulnerabilities to engage in a low-grade economic war. Instead of military action, the U.S. has imposed selected economic sanctions against certain Venezuelans. These have amounted to slaps on the wrist, with threats of worse to come. But, as January 28, 2019, the U.S. has declared a full-scale economic assault. Indeed, it declared an embargo against Petróleos de Venezuela (PDVSA)—the country’s state-owned oil company that controls the world’s largest oil reserves and produces virtually all of Venezuela’s foreign exchange. The following chart shows the course of the BMP since November 2018. For all of the dates, except today’s, the BMP has registered positive. This means that Venezuelans were willing to pay a premium for U.S. dollars on the black-market than if they were lucky enough (read: privileged enough) to obtain them at the official rate. For the privileged, Maduro’s cronies and regime insiders, the premium meant that they could buy dollars “cheap” at the official rate and immediately sell their greenbacks “dear” on the black-market. In the process, they would pocket the black-market premiums. 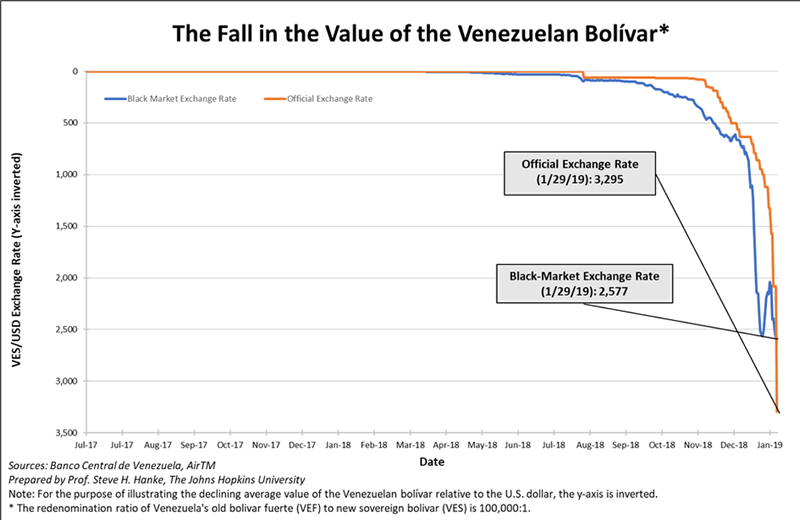 By keeping the official rate set so that the bolivar was artificially overvalued via controls, the Maduro regime could restrict access to the Venezuela’s foreign exchange reserves and doll them out to friends, guaranteeing massive profits at no risk.